We don't just tell stories, we act!vate them with physical comedy, audience participation, witty scripts, original music, American Sign Language, colorful costumes and imaginative props. Each 45 minute show is staged by professional actors and few young guest stars from your community. Every production is set before a gigantic oversized book, encouraging reading and reinforcing the love for books and literacy. Act!vated Story Theatre, a division of L'Eau Theque Productions a non-profit 501(c)3, has been touring nonstop bringing theatrical folktale shows to every nook and cranny across the U.S.A. since 1988. Act!vated Story Theatre is perfect for small theatres, school assemblies, after-school programs, school family nights, youth groups, community centers, homeschool groups and library reading programs nationwide. Bring live children's theatre to any space where students and their families gather. Act!vated Story Theatre brings the show to your community without additional travel fees. 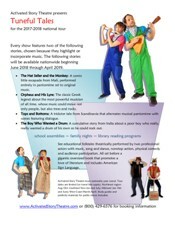 Two professional performers tour year round to bring live educational theatre to children anywhere and everywhere they live. From small rural communities to large cities and everything in between. Igniting imaginations and inspiring creativity with amusing multicultural folktales from around the world.